Nobody wants to get that call, but at 3:41 am this morning I got it. Carlos Villa had passed away. I didn’t want to write an obituary, and so I am not mentioning his numerous awards and such – so this is not an obituary – OK? It’s just that I had worked with him at the San Francisco Art Institute and saw how he had been a role model and father figure for so many students in the Bay Area and not saying something about that doesn’t seem right. Also – it’s worth noting that while a cast of colorful characters came and went, he somehow managed to stay in the game at SFAI for 43 long years. He was there getting his BFA in 1961 and was active in the art version of the counterculture revolution via the Funk Art movement. Many of his friends and fellow classmates (William T. Wiley, Joan Brown, Bruce Conner, etc.) were deeply involved in it. He was also at SFAI in 1978 when the devastating news came that Jim Jones had initiated his “White Nights” plan in Guyana that killed over 900 members of the Peoples Temple. Everyone in San Francisco back then knew at least one person that had died in that tragedy. A week later later Harvey Milk and Mayor Moscone were assassinated in City Hall by Dan White. 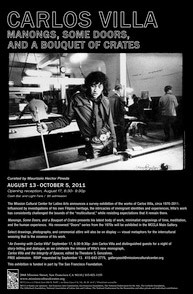 Poster from the Carlos Villa show held at the Mission Cultural Center for Latino Arts in 2011,“Manongs, Some Doors, and a Bouquet of Crates,” curated by Maurizzio Hector Pineda, with a photograph by Jerry Burchard. In a supreme irony, just a year earlier, it was Jim Jones who, as appointed Chairman of the San Francisco Housing Authority Commission, voted to acquire the International Hotel on Kearny Street, using $1.3 million in federal funds and wanted to turn it over to tenants rights groups. When a court rejected that plan and ordered evictions in January 1977, the Peoples Temple provided two thousand of the five thousand people that surrounded the building, barricaded the doors and chanted “No, no, no evictions!” (from wiki) The I Hotel, of course, was the last holdout of Manilatown, a largely Filipino neighborhood along Kearny Street that had been gentrified by the late 1970’s. In that way Carlos’ own personal history was reflected in the city’s history. He was around to witness multiple tragedies – how entire ethnic communities were effaced through urban renewal (Manilatown, the Fillmore, etc), how low-income housing was bought by banks for pennies on the dollar and turned into condos, and of course he saw the shabby treatment of the elderly that always lived in North Beach, scraping by on fixed-incomes. All of this must have informed his art practice and his teaching. He was also at SFAI when the FBI’s formerly Most Wanted fugitive, Angela Davis, taught there. She had been hunted around the country by the FBI and became the most famous prisoner in the United States for a while. Her autobiographical book caused shock waves when it was published for its brutal honesty and depictions of law enforcement. Her emphasis on the importance of ethnic studies and prisoner’s rights couldn’t have gone unnoticed at SFAI. I always wondered if Carlos knew her, but never got around asking him. But even Davis, like so many other teachers and students, came and went. Once when we were eating lunch together at Pete’s Cafe, he told me if there was any way possible, that I should stay working at SFAI. He said that in his opinion, all of the drama at art school was worth it. Putting up with the bureaucracy, the crazy students, the banality of school politics – it was all worth it. To me that said he really, deeply, cared for the school and all the potential it represented. Perhaps all of these experiences came together, inspiring him to start the first curriculum based on multiculturalism at SFAI? That curriculum, Worlds in Collision, also became a book and is an articulation of what many people felt about race and identity but had never put down on paper. In fact, it’s not too far-fetched to say he exposed a lot of people to the concept of multiculturalism in art for the first time. 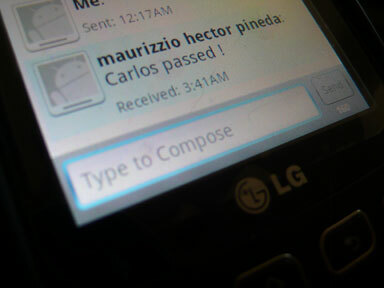 Even if you didn’t know him – just talking with him a few minutes you could tell Carlos was playing the long game. His insight, wit and sly smile will be missed. Thank you, Chris. I really get a sense of this artist/man’s commitment to the aesthetics of an artistic life. I saw and admired his art many times over the years, but never actually crossed paths with him in person. Thanks for bringing him to life. I was there as a student in 1978 with Carlos. I have carried him in my heart and my art.. since then and forever. Saw him recently at the SFAI alumni gathering a few months back. I will miss him as will countless others. I have a small tattoo on my right forearm acquired in the army years ago. One day, during my time at SFAI in the early 70’s, I was at a gathering of faculty and students out in the country north of the city. Carlos was there. We were at a table getting some food and he noticed my tattoo.”Brother!” he shouted and put his forearm next to mine to show a small tattoo he also had in the same spot. It was such a warm, loving gesture… Obviously, I remember it still. Carlos and Jerry Burchard were two wonderful men who taught everyone the power of open hearted living. Carlos was so kind to me, understood where I was coming from and gave me lots of great advice. He’s still around. We’ll all miss his voice. After graduating from SFAI, I used to see Carlos at an gym in Oakland. He was one of the first people I told that I got my first REAL job teaching at the University of Wisconsin, Madison. He made sure everyone in the whole Gym knew I was going to be a Professor. (I was only going to be a lecturer). It was sweet and something I haven’t forgotten in twenty five years. He was a great guy, I never had him for a teacher, but he along with my teachers showed my how to show affection and celebrate. Carlos Villa was the most memorable art teacher I’v ever had. I studied under him at the SFAI in mid-eighties. His comments were astute, he came from his heart and gave honest feedback. I respected his art also. Thank you Carlos!